If you or a loved one are facing homelessness, please call 311. The City of Chicago will contact us for placement. 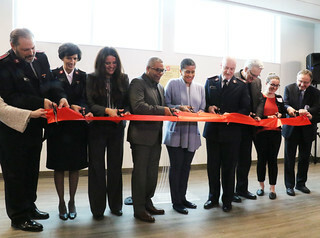 The Salvation Army partnered with the City of Chicago to create the nation's first emergency homeless assessment and rapid-response center (EHARC) to provide families facing homelessness personalized service and support. The new facility, The Shield of Hope, is an integral part of Mayor Emanuel's "Plan 2.0: A Home for Everyone" a broad-ranging, seven-year action plan that builds on Chicago's original Plan to End Homelessness. In March, The Salvation Army hosted the Grand Opening & Ribbon Cutting event and began serving some of our most vulnerable neighbors. "The City of Chicago stands firm on our commitment to providing shelter and services to those in need, so that no family is forced to sleep on the streets," said Mayor Emanuel. "Thanks to our partnership with The Salvation Army, we will create an innovative triage response system that prevents homelessness whenever possible by connecting our families with the care they need to return to housing and stability." The Shield of Hope, which is located across from The Salvation Army's Freedom Center Campus in Chicago's West Humboldt Park neighborhood, provides families in crisis an assessment, compassionate support, and a referral to the program that best meets their immediate needs, including living with family or friends, shelter or other temporary arrangement. The Shield of Hope has 75 beds available for vulnerable families on a nightly basis, and can accommodate up to 125 beds in emergency shelter situations. Families staying at the Shield of Hope will also have access to an array of services at the Freedom Center. The Shield of Hope is the newest service under The Salvation Army's Bed & Bread Club® programs, which are designed to meet the needs of individuals and families facing hunger and shelter instability. Members of the Bed & Bread Club also fight poverty by helping those who are most vulnerable access emergency shelter, groceries, nutritious meals, and utility and rent payments in order to stay in their home. 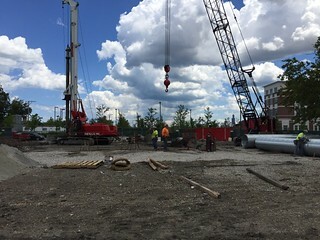 Initial funding for the construction of The Shield of Hope was provided by an anonymous gift, but support is still needed to support the ongoing services critical to helping families achieve and maintain stability. Support these life-changing programs with a gift, and/or call 773-205-3532 or 773-205-3502 to volunteer. "We are committed to providing these essential services to residents of Chicago who are most at-risk and in need," said Lt. Colonel Charles Smith, Salvation Army Metropolitan Divisional Commander. "Not only will The Salvation Army provide a safe and welcoming environment for families to live during emergencies, we will help them restart their lives by giving them the tools and resources to begin again with hope and joy. We will shield them from doubt and darkness." Below are highlights from the Groundbreaking event and construction process. To review the photo galleries, select the arrows to scroll through the images.